I was so bummed last night... I thought sure it was Wednesday and "So You Think You Can Dance" was going to be on. To my surprise... IT WAS NOT! Darn it! I so look forward to that show... oh well... tonight is another night. I'm typing like a mad woman... I have to leave soon and drive to Palm Coast..! I'm having breakfast (brunch) with one of my old friends (not that she's old...just known her for a long time) Carol... from Good Home Quilt Company. Remember when she had her shop in Orlando? Man... I loved that store. These are chore buttons! What a great idea... some motivation for your kids... and heck..who knows - maybe your hubby too!! She made a big calendar and put their names on different dates - hung it on the fridge and then stuck the button to the kids name! If they did the chore...this was their reward! For some reason... I love this pattern... pinwheels have been favorites of mine (even though I'm not that fond of making them) but when they paired it with this stripe... it just hit an "I like" button in my heart!!! 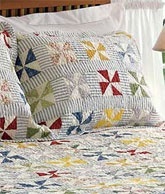 BUT... there is nothing better (to me) than a Burgoyne Surround quilt. Love them...made one for my sister for Christmas one year. You MUST pay attention when putting them together... (I have a little boo-boo in hers)!! I love how they took this old sewing machine drawer and put some little live trees in it for Christmas. 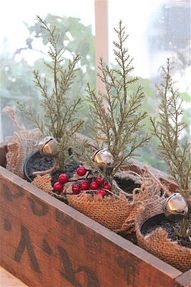 The addition of the burlap and red berries and the small jingle bells is a perfect touch. You see these drawers in the antique shops girls...better get you one! Now this... is so cute. 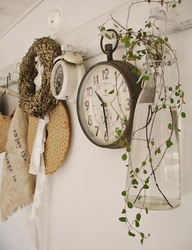 I would have never thought of hanging an alarm clock, over sized pocket watch and a jar with ivy in it from pegs along the wall. I think it's so cute. 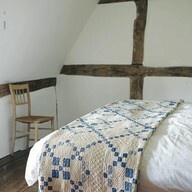 Very cottage-ee look and yet primitive and a little feminine at the same time...don't you think? Now...these hot pads I think should be made and used on a DUDE RANCH. Aren't they too cute? 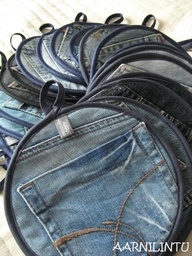 They are just the pockets of old jeans with the inserted stuff (can't think of the name) they use for hot pads (or you could use batting) with a backing and then bound. Yee-Haw... I think these are darling! Okay... sorry...that's all for this morning... I must hit the shower and get stuff in the car! Hey...make sure you sew today! !